An Organized Clutter 2013 Fall/Halloween Decorating & Crafting Round Up with Friends! I started my fall projects in August this year. 2013 will go down in blog history as the year of the "junk pumpkins", cake pan pumpkins, jello mold pumpkins, gear pumpkin, bicycle wheel pumpkin, a chef pumpkin, and a bun warmer pumpkin. 1. In this post, I re-purpose a vintage bun warmer as a pumpkin. 2. My potting sink was a great spot to set up my Chef Junk Boyardee. 3. This project was inspired by a vintage fall paint-by-number. 4. I thought that funnels looked a lot like fall cornucopias in this coke crate vignette. 5. The potting sink got a new look with old lanterns with pumpkins and a berry sieve with Indian corn. 6. Old plastic Burwood owl plaques get spray painted as Halloween decor. 7. Another fall crate vignette. 8. A re-purposed gear junk pumpkin. 9. The first of the cake pan junk pumpkins. 10. This fall door swag was cinch to make with a vintage trouser hanger. 11. Use your vintage collectibles in your fall decor. 12. Mums on the potting sink and in a rustic chair in a early fall potting bench. 13. An old bicycle wheel becomes a junk pumpkin. 14. An early fall fruit harvest mantel & a coconut oil tip. 15. Adding fall floral stems and putka pods to vintage oil lamps. 16. Here is another cake pan junk pumpkin. 17. Here's an easy re-purposed potato masher wire cloche. 18. One of my vintage head vases becomes the Black Widow. 19. Vintage individual Jello molds get re-purposed as junk pumpkins. 20. From funnels to candy corn. 21. 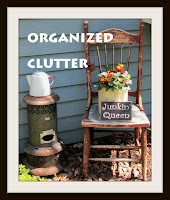 Photos from my outdoor covered patio including this fall vignette, and more vintage junk! 22. 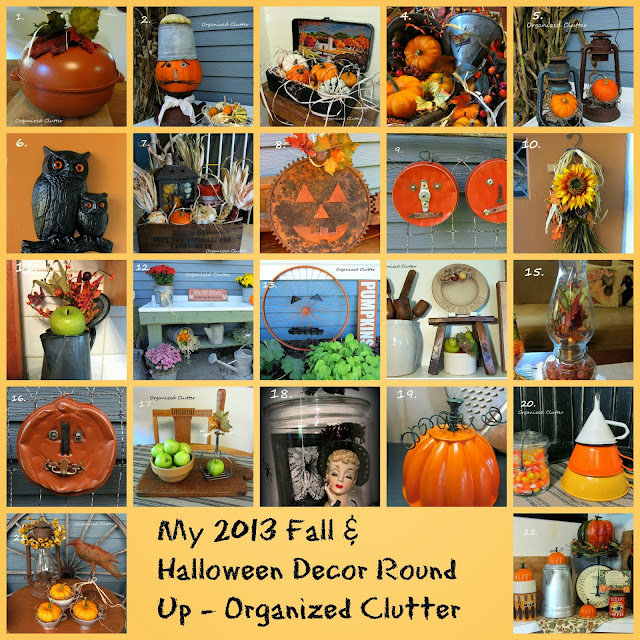 Placing my Jello mold pumpkins in a fall kitchen vignette. 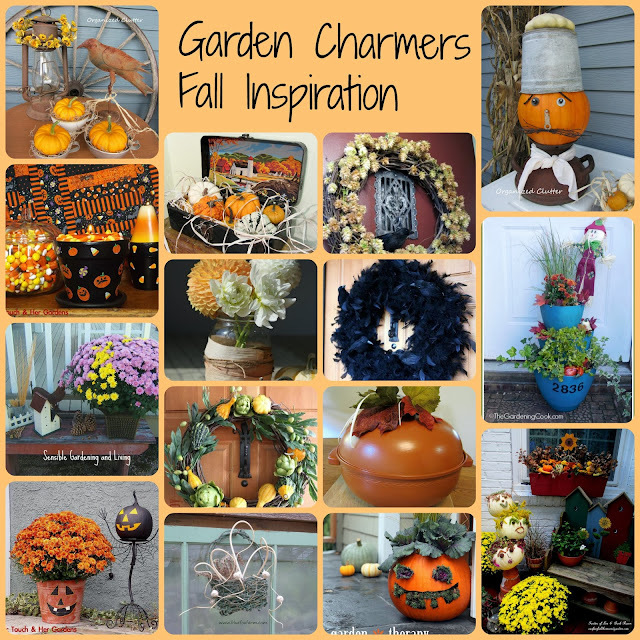 Now, for fall and Halloween projects from my gardening friends and fellow Garden Charmers. 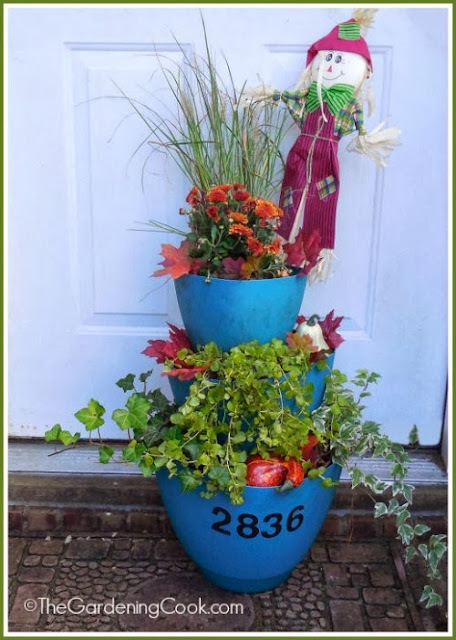 Carol, the Gardening Cook, gives her staggered planters a fall facelift. 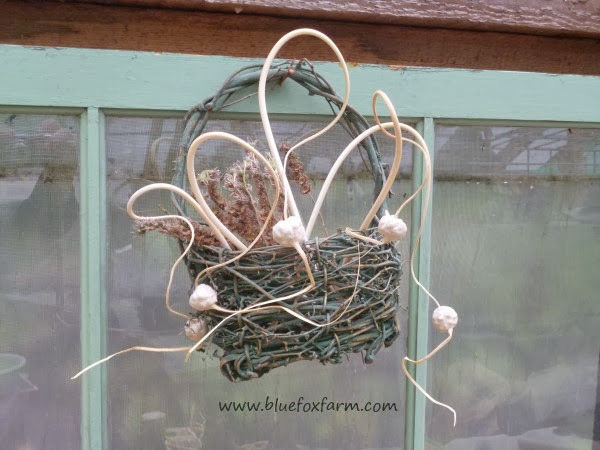 Jacki, from Blue Fox Farm, shares the the cutest little rustic basket of garlic scapes. Judy, Magic Touch & her Gardens, is a Halloween baby and loves FUN Halloween decor. 1. See how she made her black jack o'Lantern here. 2. Judy also shares how to make these cute terra cotta candle holders. And look at that Halloween quilt! 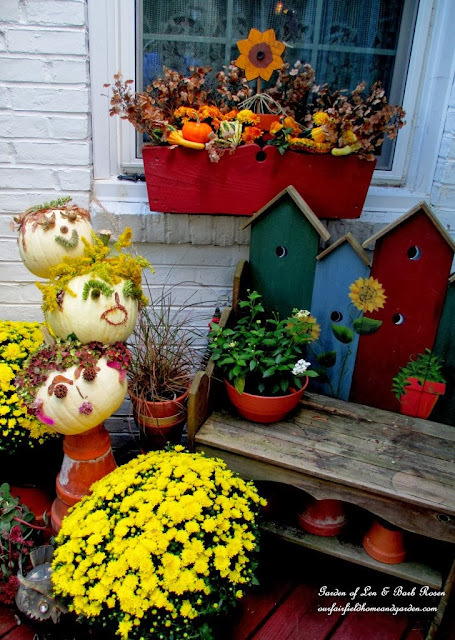 Barb, Our Fairfield Home & Garden, shares several great vignettes including these fun tipsy pumpkin heads. Stephanie, from Garden Therapy, has the knack for wreath making and also natural fall decor. 1. 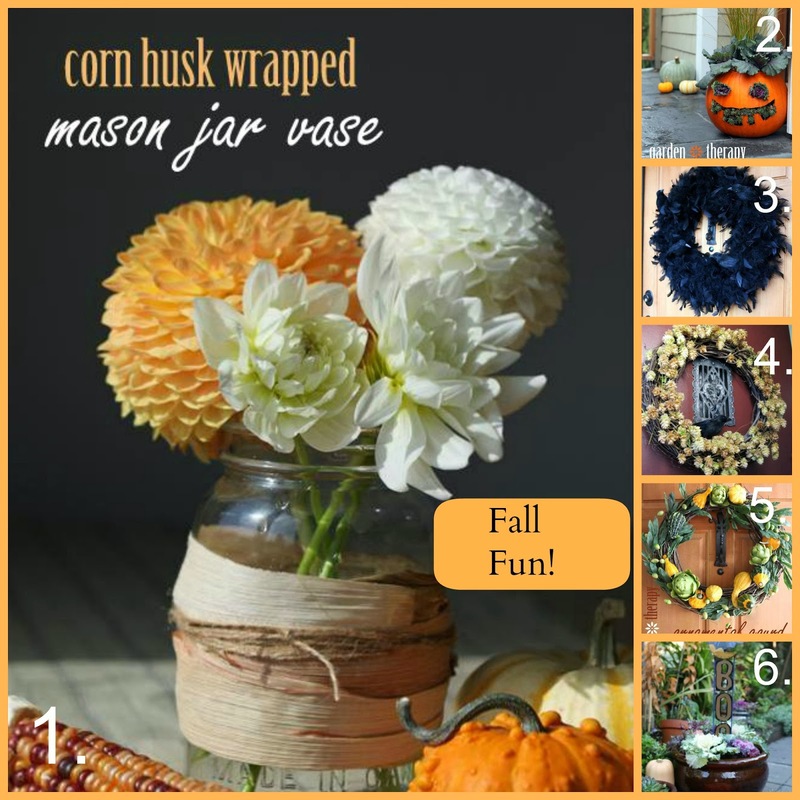 How make this corn husk mason jar. 2. I think this one is my favorite, jack o'planterns. 3. Here's a fun crow feather wreath. 4. A Halloween Hop Wreath. 5. A beautiful gourd wreath. 6. Also some fun Halloween planters. 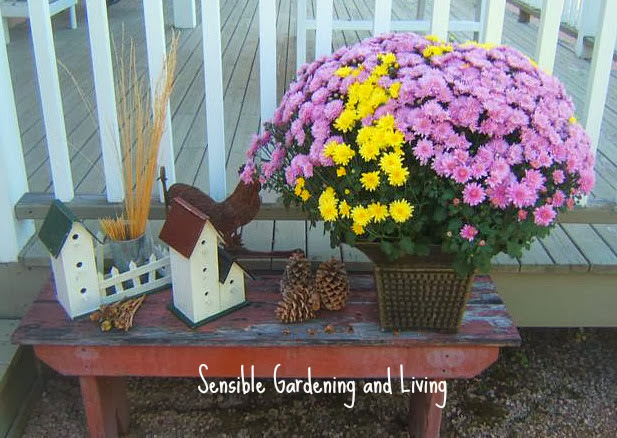 Lynne from Sensible Gardening & Living shared a speedy and inexpensive fall vignette put together with items around her house. 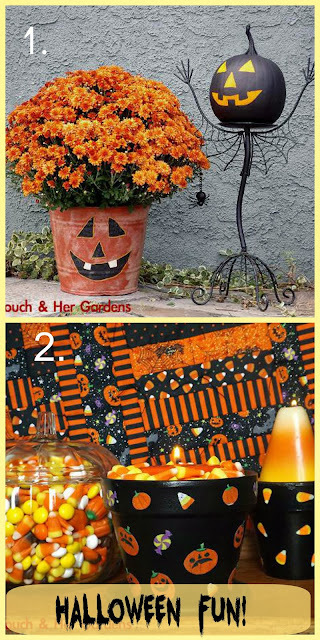 I hope you were inspired to make a fall or Halloween project this weekend! I leave you with my fall dining table vignette. Well, you've been busy with your countdown to Halloween, Carlene! I guess I better get decorating! Carlene - How fun! So many inspirational ideas. Thanks for sharing. I have enjoyed every single one of your pumpkin projects this year! Thanks for a fun roundup of some others as well! In addition to the most creative junk pumpkin patch I've ever seen, you've got some pretty creative friends!